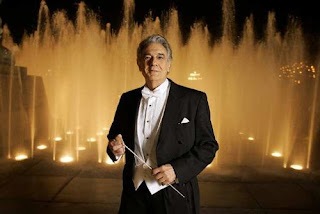 In an online poll conducted by the Downtown News in Los Angeles, when given the choice among four prominent LA downtowners -- including Mayor Antonio Villaraigosa and Laker Kobe Bryant -- 66% of those responding to the poll would most like to have lunch with Los Angeles Opera's general manager and superstar tenor Plácido Domingo. Phil Anschutz, the head of Anschutz Entertainment Group, came in second with 16%, followed by Laker Kobe Bryant with 14%. Mayor Antonio Villaraigosa was in last place, as only 6% of respondents said they would most want to chow down with him. PS: the L.A. Opera's 2009-10 season launches Sept. 12 at Dorothy Chandler Pavilion with Donizetti's The Elixir of Love.